This new format pitches 2 footballers against 2 opponents in a better-ball matchplay event, something the footballers thoroughly enjoy, as they very seldom get the chance to play with one another, in the same team, against however many opposing teams of 2, the Corporate client can raise. You can select any number of footballers from 2/4/6/8/12, or more, from our extensive list of ex- and recently retired players from our Professional Football portfolio . The cost to you and your company, would depend on the footballers you choose and their availability. Needless to say you get the chance of competing against some of the games superstars whose competitive nature will test you and your partner to the limit. At the moment gentlemen we are unbeaten, why not try and be the first Corporate golf team to knock us off the pedestal. If you run your mouse over the faces of our recent football celebrity golf team you will find who I selected for our first corporate footballers matchplay challenge. Are you ready to take on my next team? Having inflicted their first ever matchplay defeat 5-2, at their own club in 2013, the members made a much better fist of the job this year. With so many members desperate to be part of their team, the numbers this year were raised to 18 a-side, it could have been more, if only I had been able to persuade more footballers to take part. It was a day they were already committed to other charity golf days up and down the country and unfortunately couldn't make it. Burhill's captain Temi Kapo, selected some of the better club golfers into their team this year, not wanting to suffer another years banter and wind-ups, they have endured since last year. On top of that, Britains Ryder Cup hero from 2012 Ian Poulter, visited the club during a recent trip in the UK and got into conversation with a couple of Burhill's members who told him of their upcoming match. The following video; a must to see, certainly had the desired effect on their team and they ended up winning quite handsomely 7-2. Thank you Mr Poulter, your video is entertaining and much appreciated, perhaps you might do it for us next year!! The footballers are already itching to get revenge in next year's return at Burhill and we look forward to relieving them of the Trophy we handed back this year. Any other golf clubs and members that feel they have the quality and numbers to challenge and entertain us at your golf club in a similar Matchplay format please call: Terry Mancini 07770 653475 and enquire, we are always available for a great afternoons competition and plenty of banter. ENJOY!! 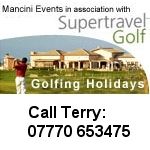 Call Terry Mancini on 07770 653475 to discuss price, or players you have in mind and hopefully we will see you soon.